The Notify Producers button was created as a quick way for hubs to notify their suppliers of what items were ordered from them in an OC. There’s a model in Australia (Prom Coast) where this would be a very handy feature, BUT in this case the suppliers take responsibity for packing items by customer. The Notify Producers email currently only contains the items ordered and the total QTY. This hub needs this to be broken down by customer. Could we have an option for the email to include customer details? Hubs who have many suppliers to communicate with, and when those hubs need to pack by customer. Another Aus example that could use this tool is the Farmer’s Market pre-order shops. Users who would otherwise find the Notify Producers tool to be very helpful can’t actually use it. This means they spend more time downloading reports and emailing them to producers, so producers know what to pack for each customer. Here’s an example of the Notify Producers email as it currently stands. If they could see the code, first name, and last name fields in that report, we’d be alright. This becomes more problematic when dealing with exact weight/volume products, like meat, that would be invoiced at a specific price to a specific customer, before they collect their orders from us. Without that data, our hub volunteers would have to go through invoices individually to find the right product and price, vs. placing the labeled products in the named bins. How hard would it be to let hub suppliers see the names of those who ordered their products in the packing report? Hi there @tschumilas @CLFC - this is row 62 in the giant roadmap spreadsheet of all things. I just checked and it didn’t have any votes in the last round, also the only named user who wants it is Epicentre (Fr). Should I add your Hub and Canada as interested? and also, there are revisions to the voting process going forward so I think you will be able to allocate some Canada votes for your priority features We need to knock off that report which you got in in this round though first! @Kirsten - yes, definitely interested. I replied on the other thread, so I won’t repeat myself here. @lin_d_hop if I read the post above I think we kind of agree that the need is to display the name in the report, not to add customer details in the notify producer email I propose to close that discussion as seems covered by Hub's suppliers can prepare the invidual orders for the hub's customers we will see there if the notify email needs a new mention about the possibility to see customer details in X report. Here’s another thought. (This is applicable to a hub setup, since that’s what I’ve been testing.) When an order is placed, the hub coordinator gets a confirmation email. 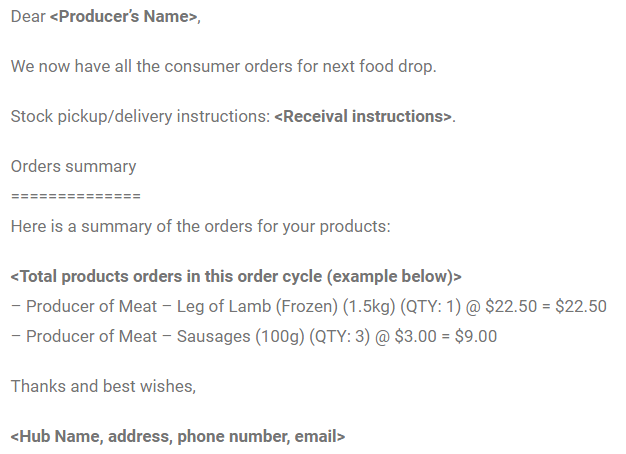 This email contains all of the information any of our producers would need to package their orders. The shopper’s name, their email, their phone number, the products ordered, quantities, etc. How hard would it be, when an order is placed, to basically use that existing template, and notify each enterprise in the order, as they are placed? Seems like the sort of thing where the data could be looped through fairly easily, and would let enterprises see their orders come in real time - instead of waiting until the OC closes. I think our producers here may even prefer that. I’m sure there’s far more to it than that, on the code side, but it’s the kind of starting point I’d look at if I was trying to implement it … re-using existing snippets instead of re-inventing things. Thought I’d throw it out there as a suggestion anyway. I don’t know about this solution @CLFC. Its a LOT of emails - if the details of every order goes to every supplier. In the hub I supply for example - I would end up getting about 300 emails in every order cycle - and only about 5 of them would include products I need to supply. So maybe - if this could be turned off and on - but by default, I wouldn’t vote for such a feature. Yes, definitely a lot of emails … I’m just trying to think of solutions that could use existing functions, maybe just in different ways.